I wanted to visit a remote place that had spotty Wi-Fi and cell service, so that I could refrain from the everyday social media, email, and text message checking that I find myself constantly doing. So my boyfriend and I packed our duffel bags and headed to the beautiful white-blanketed grounds of Yosemite National Park. SIGHTS: Traveling to a national park on super bowl weekend gave us the advantage of roaming the park without bumping into too many people. At 24 years old I have never seen or touched snow. I know, it’s weird. Now that we’ve established that, off we go into about 748,000 acres of nothing but beautiful ponderosa pine and black oak trees. With only 3 1/2 hours of driving under our belts, we were greeted by the welcoming smell of fresh air and pine needles. The instant Wi-Fi reception was lost, we were able to really soak in the recently settled rain and snow dangling from tree branches and covering the ground. Our first order of business was to visit the Yosemite Ski and Snowboarding Area. Just to reiterate, this girl has never been in the snow, but I definitely wanted to give snowboarding a try, hoping that I might defy all odds and turn out to be a pretty good snowboarder on the first try. I definitely mastered the art of falling. Getting up is apparently only half the battle. But I was determined to give it my best go, so I traveled to the top of the misty mountain on the ski lift. Enjoying the views of skiers and snowboarders riding down at the fastest speeds quickly made me realize that going all the way to the top was a mistake. I was a rookie who could barely travel a couple of feet without falling down, so I wasn’t sure how I was going to the bottom. I embarrassingly caught a ride down with a staff member as the area was closing. Snowboarding is definitely harder than it looks, but it won’t be my last time trying. 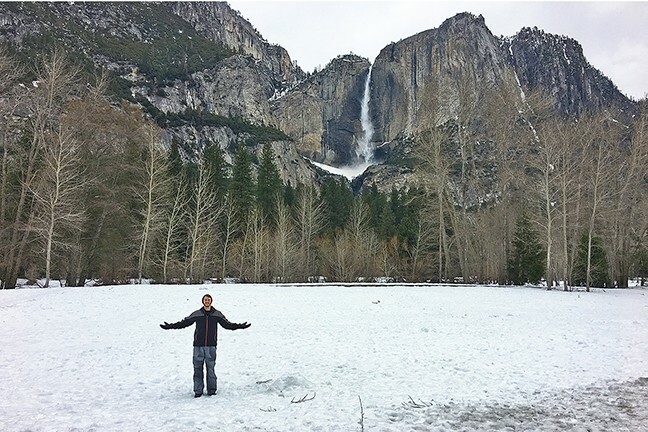 HEIGHTS: Being in a place like Yosemite during the winter season brought the idea of a white Christmas to mind, something that isn’t seen on the Central Coast. Day two was a day for sightseeing, to drive around the park and really soak in the beauty of it all. 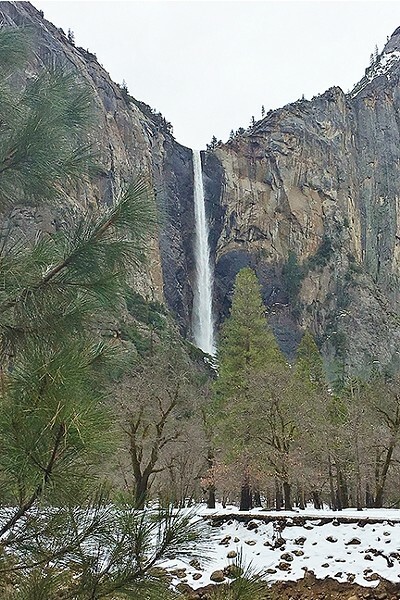 It was breathtaking to see the downpour flowing of Yosemite Falls and the stunning formation of Half Dome. But what caught my eye was a sign we stumbled upon while making our way toward the park exit. The sign read “On this site, President Theodore Roosevelt sat beside a campfire with John Muir on May 17, 1903, and talked ‘forest good.’” John Muir was an influential conservationist and writer. He was “The Father of Our National Parks.” It was in Yosemite, on that site, that he urged the president to work for preservation of “priceless remnants” of America’s wilderness. He inspired President Roosevelt’s conservation programs and the first National Monuments by Presidential Proclamation and the creation of Yosemite National Park by congressional action. In 1892, along with other supporters, Muir formed the Sierra Club and was its first president. Today, the Sierra Club has more than 2.4 million members and supporters that continue to preserve wildlife. It was amazing to see the historic site in all its beauty and to be reminded of its beginnings in a wild place—not in a museum. BEAUTY: Yosemite National Park has a lot to offer, from amazing sites to history lessons to a much-needed getaway from the fast-paced world. Check out the Yosemite National Park website (nps.gov/yose) before your visit for road closures and park information. After a couple of snowball fights and the obligatory building of a snowman, we made our way back to the Central Coast. Three days of being enveloped in the mysteries of nature was not enough, but checking Yosemite off my national park list was satisfying. I can’t wait for a summer visit. Karen Garcia is making snow angels at kgarcia@newtimesslo.com.